TennisDynamics specializes in offering group tennis lessons for kids and adults in Naples, Florida and throughout Collier County. As the contracted tennis agent for Collier County Parks & Recreation, most of our programs are sited in Naples at Collier County Parks. 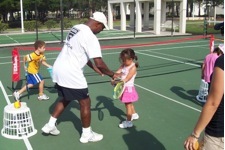 TennisDynamics also provides programming for neighborhoods, gated communities and country clubs. Our programs and lessons are taught and administered by experienced and highly trained tennis professionals dedicated to making learning and playing fun and fulfilling. A major aspect of TennisDynamics activity is delivering the United States Tennis Association’s “Ten and Under” programming. This provides the use of tailored courts and equipment to make tennis “user-friendly” for kids between the ages of four and 10. TennisDynamics further offers the “RallyTennis” format which allows beginner kids to play on teams and enjoy recreational competition even when they are just getting started. Staffed with several of the most experienced tennis pros and businessmen in the country, TennisDynamics also provides consulting and tennis training services to commercial clubs and tennis organizations throughout the world. Spike has been enthusiastically and diligently teaching tennis over 48 years. Starting in 1964 as the tennis instructor in the park system in his hometown of Penfield, a suburb of Rochester, New York, Spike has taught tennis every year since at various capacities. In 1969 he graduated from Brown University, where he captained and played number one for the varsity tennis team. He also acted as the player/coach of Brown’s squash team, and achieved a # 8 national intercollegiate ranking. After a year of working as an educational training specialist for Rochester’s Xerox Corporation, Spike joined Tennis Corporation of America (TCA) in its second year of operations as a tennis instructor at the world’s largest indoor tennis club at the time, Mid-Town Tennis Club, in Chicago. Spike helped build TCA to be the country’s biggest operator of indoor tennis clubs, managing clubs from Seattle to Boston. As the Director of Tennis and Chief Operating Officer of TCA, Spike hired and trained hundreds of tennis professionals, and developed programs for over 250,000 newcomers to the game. He also coached numerous nationally ranked junior players, including Billy Nealon, who he helped attain the number one ranking in the country in the Boys 14’s. Spike has been instrumental in many aspects of tennis growth nationally. He was considered the founder of the National Tennis Rating Program, bringing together the various national tennis organizations in the late 70’s to adopt the universal tennis player rating system that’s become the cornerstone for national league play. He also consulted extensively with the United States Tennis Association in developing senior tennis programs, in upgrading operations of the National Tennis Center (home of the U.S. Open), and in rolling out the USTA’s “Play Tennis America” program to bring new adult players into the game. He served three years as the President of the Eastern United States Professional Tennis Association (USPTA), and acted as the Chairman of the USPTA National Nominating Committee. An avid competitor himself, Spike was the Eastern USPTA singles and doubles champion, and has been a doubles semifinalist in the National Grasscourt 45’s Champion -ships. He similarly was ranked highly in squash, attaining the 26th position on the World Professional Squash Tour and an # 2 ranking nationally in the 45’s division. Residing in Naples and Ft. Lauderdale in the late 90’s, Spike was awarded the USTA Florida’s “Outstanding League Coordinator” of 2000 for his work in developing “Ralleyball” youth programs in both cities. To help the growth of tennis in Florida, Spike taught the game to his wife, Renee, and they have further added their nine-year-old daughter, Solana, and three-year-old son, Alejandro, to the rosters of local players.